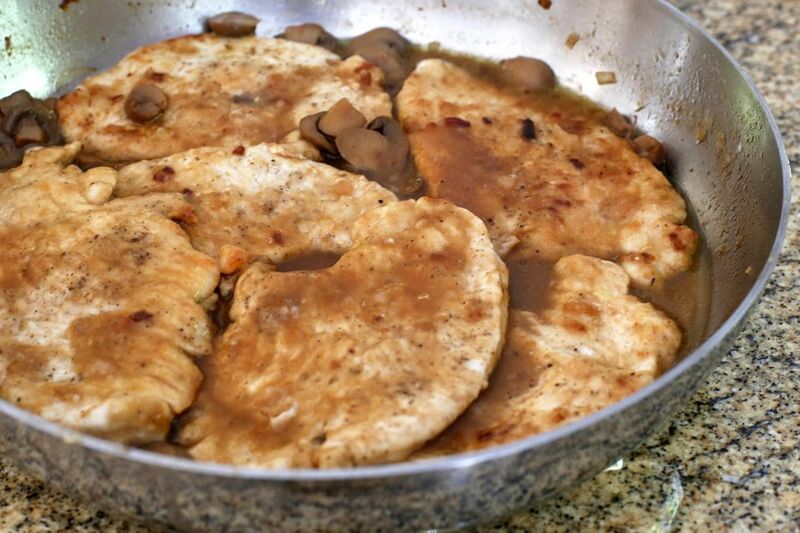 This turkey Marsala uses thin cutlets, making a relatively lean and delicious dish, and it takes just minutes to prepare and cook. The dinner can be ready (with some quick angel hair pasta and a salad) in under 30 minutes, and there's very little mess. Serve the turkey with a variety of vegetables or a salad for a light meal, or make a heartier dinner with angel hair pasta or roasted potatoes. Put the flour in a wide shallow bowl. Lay the cutlets out on a flat surface on waxed paper or parchment (less mess!) and season both sides with kosher salt and freshly ground black pepper. Coat the cutlets thoroughly with the flour. In a large skillet or saute pan over medium heat, melt the butter with 1 tablespoon of the olive oil. When the butter is hot and foaming, add the cutlets. Cook for 2 minutes on each side. Remove to a plate and set aside. If your cutlets are thin, you might have to do this in two batches. Add the chopped shallots to the saute pan and cook stirring, for 2 minutes. Add the sliced mushrooms, if using, and continue cooking until the mushrooms are tender, about 3 to 4 minutes. Add the Marsala wine and chicken broth to the pan; bring to a boil over high heat, scraping browned bits off of the bottom of the pan. Cook until the juices are reduced and thickened, about 5 minutes. Add the turkey cutlets back to the pan. Reduce the heat to low and simmer for 2 minutes longer. Serve with a salad and hot cooked angel hair pasta or thin spaghetti, or serve a side of roasted potatoes. Omit the shallots and add sliced green onions to the turkey the last 2 minutes. Use small thinned chicken breasts or chicken breast cutlets in place of the turkey breast. Make the dish with veal cutlets or thin pork cutlets. Add a few herbs to vary the flavor. A tablespoon of fresh thyme or a scant teaspoon of dried thyme leaves would be good, or add about 1/2 teaspoon of dried leaf basil.